Sleek slim-lined spears made from stainless steel with a glass lens. 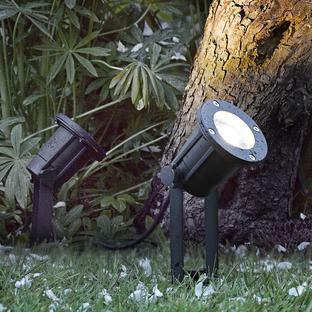 The Tin spotlight spears are ideal for the contemporary urban garden where a smaller light may be required. A 28W GU10 bulbs is included but this light can take up to a max 35W bulb. The bulb included emits 215 lumens of light and will have a life of approximately 1,000 hours. 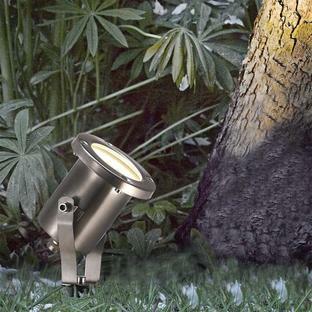 An LED version of this spotlight is also available, complete with a 3W LED bulb. This LED bulb emits 200 lumens of light and will have a life of approximately 25,000 hours. Typically, with 6 hours of use a day, you will save the extra cost of this LED version in the first year in reduced electricity and bulb costs. Please note that the flex on this plug cannot be removed. 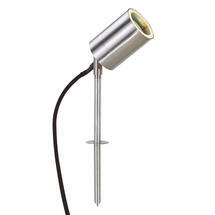 This stainless steel light must be treated with acid free oil (which is included) 3-4 times a year. We do not recommend to install lighting made of stainless steel in an aggressive (e.g. coastal) environment. 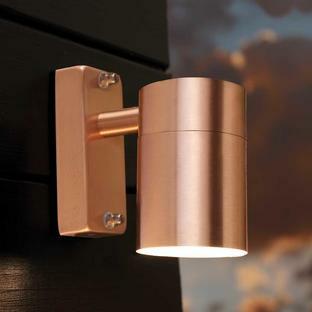 Also available in the Tin range are wall lights, LED wall lights and wall lights with motion sensor.